Watch our Video…and get up close and personal with the elephants HERE!! Most people associate Thailand, or South East Asia with elephants, myself included… Specifically….Riding Elephants. I mean, obviously I knew these things…weren’t natural to the elephant… I knew they weren’t born natural Micheal Angelo’s or little David Beckhams…I knew they were trained to do these things…but I could have never imagined what these elephants had to go through in order to get there. It’s a heart breaking….sad..sad…sad…story…but I think it’s important to share and bring awareness to this issue, in the hopes of helping more people understand just exactly what they’re supporting, when they choose to partake in these kinds of activities. Which unfortunately most tourist do, because they honestly just don’t know any different. I was almost one of them!!! I am not an expert on this topic by any means, I don’t have all the answers, my only intention is to share what I have learned in the hopes to help others have a better understanding of their own. As I mentioned earlier..the elephants in Thailand are used in the tourism industry for many different reasons…they are also used in the logging industry, which is now illegal here in Thailand…but unfortunately many places are still doing it. All the elephants you see working in the tourism industry, have all gone through a process called the Phajaan…the literal translation is divorce…also known as the “Crush”…basically meaning to divorce the elephant from it’s spirit, or to split the will of a an elephant. The “Crush” is a 3-7 day process performed by the elephants Mahout…. 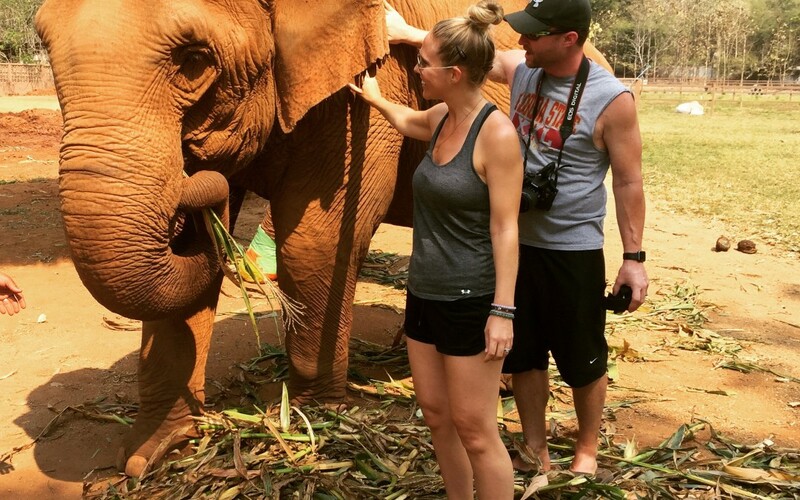 (The Mahouts are the elephants care takers, trainers, and the closest thing to the elephant) where…the elephant is basically tortured physically, mentally, and spirituality. This process strips away the elephants soul and spirit…breaking them down piece by piece until they have no will to live…they have no other choice but to now be obedient and surrender control over to the Mahout. At this point they are ready to be trained and they become usable for tourism. I repeat…All elephants…All of them…must go through this process in order to enter the tourism industry. They have to be broken of all natural habits and behaviors, and taught new ones! Even after the crush process..once they enter into tourism…many elephants are drugged…forced to work long hours in the heat, forced to work when they’re hurt or sick, and beaten if they do not follow orders. This topic isn’t pretty or fun to talk about..but this is the truth behind what is really happening here in Thailand and it’s a huge problem!! The more people that become aware of what’s really going on..the more people that learn about alternative, more humane ways to experience elephants.. The less tourists will choose go to the trekking places ect…and there will no longer be a demand or a need for them! The tourists won’t come and they’ll be put out of business!!! Elephant sanctuaries are where it’s at…and its definitely becoming the new wave of tourism here in Thailand…which is amazing!! We are currently in Northern Thailand, Chiang Mai, and there are elephants everywhere. On every corner, there is someone trying to sell you some kind of elephant tour. We took an hour and a half bus ride out of the city, into the mountains and to Elephant Nature Park!! This was an eye opening experience, and one of the most incredible experiences we’ve ever had…Check out our VIDEO HERE! ENP is one of many Elephant Sanctuaries in Northern Thailand. These are parks designed specifically to rescue and rehabilitate abused, sick, mistreated, and distressed elephants. They provide a safe haven for elephants to rehabilitate and heal their Mind, Body & Souls. Many elephants in the park have come from pretty traumatic pasts…Unfortunately many suffer from mental illness when they first arrive…They have been working in the industry for years…many many years…and they are traumatized!! It can take quite some time for them to integrate, feel safe, and to adjust to this completely new way of living. At the park they are FREE to be themselves…They are FREE to roam…They are FREE to make new friends…which is a totally new and foreign concept to these elephants at the time of entry. After Love and Trust is built between the elephant and the Mahout, they create a beautiful bond and a life long friendship! The Elephant Nature park currently has 71 rescued elephants, 400 dogs, tons of water buffalo, cows, pigs, and cats…yes that’s quite a spread…but they’re like one big happy family…they all intermingle and hang out! Elephants have incredible memories..They are very sensitive animals. They have the same emotions as humans..they feel sad, excited, happy, angry, irritated. They connect deeply, and form incredible bonds and families with one another. They all have different personalities….different quirks….just like us. Even though they will never forget their past, they are able to move on and live pretty happy lives at the Elephant Sanctuary. Lek is the founder of the ENP. She is a leader in the world of elephant conservation. She is incredible, and is doing such amazing work in this world! She literally sits underneath…I repeat underneath..If you’ve ever been in the presence of these massive creatures…you know…it’s kind of intimidating..They’re just that BIG!! Anyway she sits underneath the elephants and sings them lullabies..When they see her, they run to her…they surround her…they give her kisses with their trunks.. they shower her with love and appreciation!!! The elephants love and trust her so deeply…it’s a beautiful relationship and bond they’ve formed, and I’m so grateful to have been apart of a movement that is so powerful!! If your in Thailand and want to experience something truly magnificent, come check out Elephant Nature Park! !